Easter Double Header 2 days of top class motorcycle speedway. Remembrance Championship (all classes) Saturday April 20th, 1pm start. Sidecars, Senior & Junior Solo bikes. 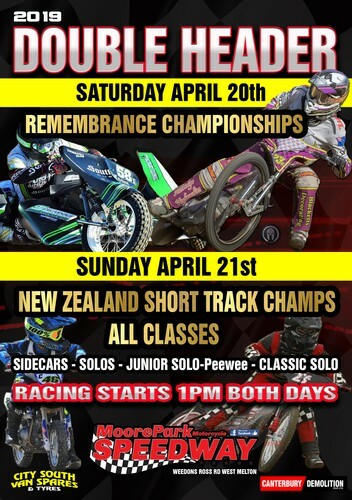 New Zealand Short Track Championship (all classes) Sunday April 21st 1pm start. Sidecars, Senior & Junior Solo bikes. These are the last 2 meetings for the 2018/19 race season. Get your last fix of Motorcycle speedway before winter sets in. Sorry cash admission only No EFTPOS. And please no class or dogs.